Literally translated the word ‘Tang’ refers to the Tang Dynasty of China which reflects the shared cultural background between China, Okinawa and Korea (617-907AD). ‘Soo’ means hand but implies fist, punch, strike or defend. ‘Do’ means way of life or art. 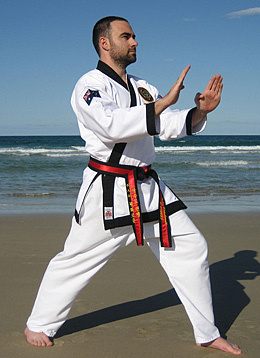 The Tang Soo Do style of martial arts believes in tradition. Traditions carry knowledge forward from one generation to the next. This knowledge is built on respect for the people who have gone before us. This helps to build a more stable individual and a more centered person. Tang Soo Do recognises the achievement of those who strive to accomplish their very best through determination and perseverance. Tang Soo Do provides traditional family values that help develop responsible individuals with solid ethics and a strong sense of family and community spirit. Tang Soo Do includes great exercise, stretching and relaxation. Practicing the martial arts significantly reduces the effects of stress and also improves and encourages a healthy lifestyle. True success cannot be achieved without discipline. Students see their instructors perform feats that seem almost impossible. Under specialized instruction, careful supervision and regular practice students are soon building those same skills. The method used to build Tang Soo Do skills are the same methods used to be successful in life. Our character is measured regularly in dealing with problems throughout life. It is our strength of character which determines how successful we deal with each issue to go forward in life. Tang Soo Do teaches elements of good character as our principal method of teaching leadership to our students. Successful people are persistent. They make sure their goals are specific, measurable, motivational, achievable and challenging. They visualize their target, determine how to achieve their goals and take action. Our 5 codes were created by a monk, Won Kwang, around the time of the “Hwa Rang Dan” and the New Silla Dynasty of Korea (668AD-935AD). The 5 codes apply to all members and are meant to guide the Tang Soo Do practitioner.